I was diagnosed with depression in my late twenties. I had two children in my early thirties and with each one I had post-partum depression. After my second child, the depression was worse than after the first. At various points I wanted to die. I began cutting myself. The depression worsened when my husband who is an active duty service member was stationed three hours away from our home. He only traveled home on the weekends. I was alone most of the time with a baby and a toddler who was having severe behavior problems. She was later diagnosed with ADHD and ODD. My husband was not able to give me the support I needed because he physically was not home during the week. He was also mentally and emotionally unable to be there for me because he was dealing with PTSD from serving a year in Iraq. He also it turns out had undiagnosed ADHD and General Anxiety Disorder. I had no help most of the time. Then I found out I was pregnant with my third child. It was a nightmare. I never in my life thought I, a married woman, would ever be in a situation where the word abortion would cross my mind in regards to my own life. It did, though. The troubles my family was having were not temporary and carrying a third child would have been the tipping point for me becoming even more depressed and possibly even dangerous not just to myself but to my living, breathing children who at the time essentially only had one parent, me. I did not want to be the woman who turned up in the news because I had hurt my children. That is what very well could have happened because the post-partum depression from my second child was already too much to handle alone, a third pregnancy would have made it worse. If I was going to get any better I absolutely could not have a third child. My husband agreed. 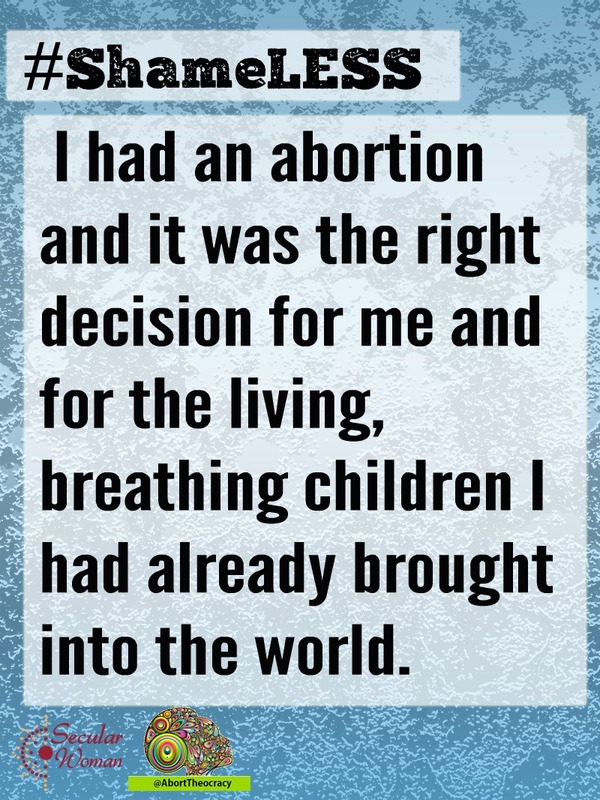 I had an abortion and it was the right decision for me and for the living, breathing children I had already brought into the world. My family’s problems weren’t solved by having an abortion, we have all continued to struggle with our various issues, but having the abortion allowed me, at least, to get on track to being healthy again. Today, my family deals with ADHD, ODD, anxiety, and depression but it is a happy, healthy, united family. The only reason we were able to get to this point is because my husband and I made the hard, but necessary decision to end a pregnancy that would have caused my depression to spin further out of control. I am proud of our decision and of the time and effort we’ve put in to make our family better and stronger. So, if I’m proud of my decision why am I choosing to remain anonymous? It’s pretty simple, there is a world of hateful, dangerous people out there that do not feel that I have the right to make decisions about my own health and welfare and they would derive pleasure from threatening and intimidating me and my family. Just as I was not willing years ago to risk my family’s well-being with a third pregnancy, I am not willing to risk it now so that someone lacking the ability to empathize can use my family as a target.